Proper breathing during your run can help increase your endurance and provide your muscles with the oxygenated blood they need to sustain your run. As you run, you naturally begin breathing more heavily to supply your lungs with more oxygen. By taking control of your breathing, you can enjoy better oxygen intake without the sensation that you can't catch your breath. Breathing exercises can help teach you the proper way to breathe and adopting a comfortable rhythm can help you sustain optimal oxygen intake. Practice breathing before you run. While it may seem silly to practice something your body does instinctively, proper breathing technique while running could mean the difference between feeling out of breath and going the distance. Lie on the floor with your hand on your belly and breathe in deeply. Breathe deeply enough that your hand rises over your belly. This allows the oxygen to flow through your lungs for optimal intake. Begin your workout with static stretching. While traditional stretching, where you lengthen each major muscle group, is necessary, static stretching helps to warm your muscles and regulate your breath before you begin running. It also allows you to practice your breathing rhythm before you begin. Walk or jog slowly for five to 10 minutes before you begin, taking the time to focus on breathing in deeply and exhaling in a controlled manner. Breathe in and out using a cadence. 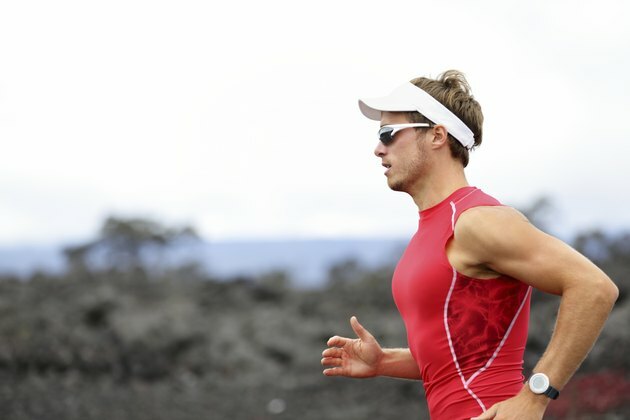 A running cadence is a rhythm of breathing controlled by counts. While some runners prefer an uneven cadence of two breaths in and two breaths out, others prefer inhaling for three counts and exhaling for two. Try both cadences and adjust the counts until you reach a cadence that helps you feel in control and comfortable during your run. Listen to music as you run or count your footsteps to control your cadence. By choosing music that has the appropriate amount of beats per minute for the pace you run, you'll automatically have a way to remember when to breathe in and out. Breathe through both your nose and your mouth, if possible. This allows the most oxygen intake possible by taking in oxygen through both airways. If you feel out of breath when running with your mouth closed, it's likely because you aren't taking in enough oxygen through your nose alone. Relax while you run and start your routine somewhat slower than your steady pace. Everything Running Book: From Circling the Block to Completing a Marathon, Training and Techniques to Make You a Better Runner; Art Liberman, et al.